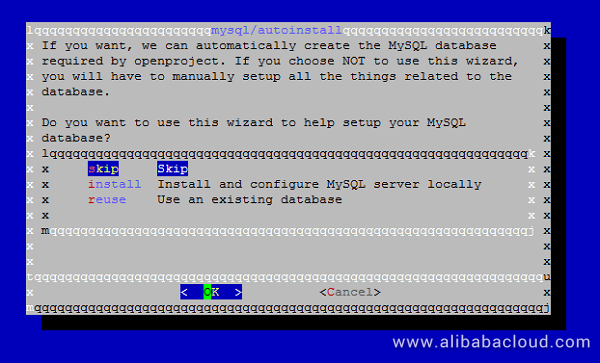 In this article, we will be installing OpenProject on an Alibaba Cloud ECS CentOS 7 server. By Sajid Qureshi, Alibaba Cloud Tech Share Author. Tech Share is Alibaba Cloud's incentive program to encourage the sharing of technical knowledge and best practices within the cloud community. 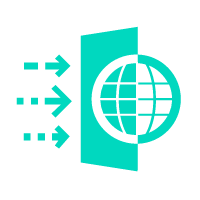 OpenProject is a free and open source web-based management system. OpenProject is written in Ruby on Rails and AngularJS. It is used for project management and it support various features like task-management, team collaboration, scrum, and many more. You must have an Alibaba Cloud Elastic Compute Service (ECS) instance activated and have verified your valid payment method. If you are a new user, you can get a free account in your Alibaba Cloud account. If you don't know about how to setup your ECS instance, you can refer to this tutorial or quick-start guide. Your ECS instance must have at least 1GB RAM and 1 Core processor. A domain name registered from Alibaba Cloud. If you have already registered a domain from Alibaba Cloud or any other host, you can update its domain nameserver records. In this tutorial we are using root user privileges for the entire installation process. You can switch from non root user to root user using this below given command. You are recommended to upgrade the available repositories and packages before installing OpenProject. You can do so using following command. First of all you'll need to add OpenProject repository for CentOS 7. Run following command to do so. Once the repository is added now you can install OpenProject. Run following command to install it. After the installation is completed, you should see Installed as result on terminal. After completing the installation of OpenProject you'll have to configure it. We will configure the database using MySQL, the webserver using Apache, configure a domain name, add support for Git and SVN, configure email notification, and enable Memcached to get better performance for OpenProject. Run the following command to configure the OpenProject. Once you execute the command, you'll see following interface. You will be asked if you want the setup wizard to automatically create the MySQL database required, select install option to install and configure MySQL server locally. If you want to use PostgreSQL database to use with OpenProject then select skip. If you wish to use and existing database then select reuse option. You should select install option to avoid the hassles of manual database configuration. In the next interface, you'll be asked for the web server configuration. 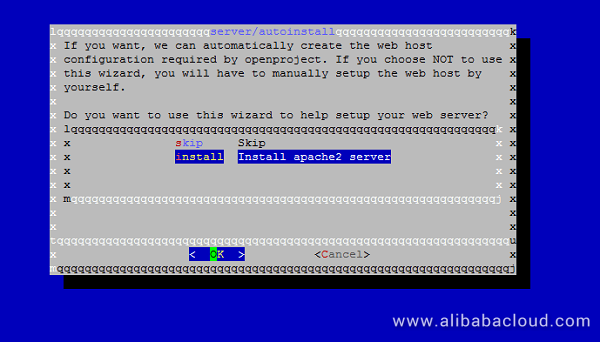 Simply choose the 'Install apache2 server' and click 'OK'. it will automatically install the apache2 web server and configure the virtual host for OpenProject application. In the next interface, you'll be asked for fully qualified domain name for your Openproject application so simply enter the domain name then click on OK button. In the next step, you'll be asked for the server path prefix, you can leave it blank. If you want to provide a path to your application then you can provide here. Otherwise proceed to further installation. Next, you'll be asked for the SSL configuration. If you have SSL certificate then choose Yes otherwise select NO and proceed further. Next, you'll be asked to setup Subversion and Git support. Choose Yes and install these features then you'll be able to create and host Subversion and Git repository into your application using Apache. Next, you'll be asked for email configuration for the application. If you don't want your application to send any emails then select Skip otherwise choose as you need and click on OK button to proceed further. Finally, you'll be asked to install memcached server. Memcached server is a powerful, high performance distributed memory object caching system. So install it to get better performance of OpenProject. 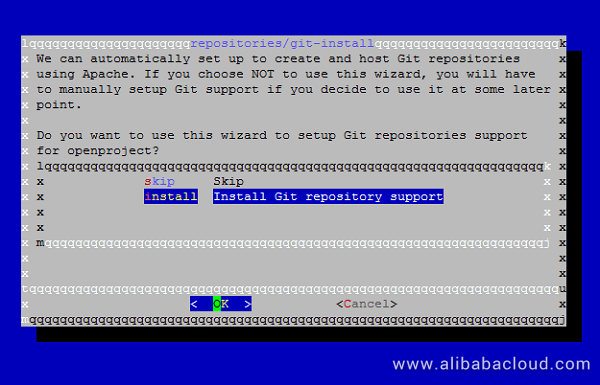 It will automatically install and configure all of the packages for openpoject installation. Click on the Sign in button to access the admin dashboard, and use 'admin' as a user and password. Next, you'll be asked to change current login password so change it to as you wish and click on Save button to proceed further. Congratulations! You have successfully installed and configured OpenProject on your Alibaba Cloud Elastic Compute Service (ECS) CentOS 7 server. 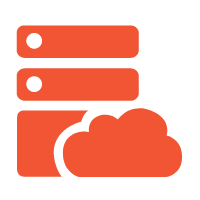 You can now easily setup and configure OpenProject on your VPS or cloud server.